Home » Banyas: The Next Big Thing? Herodotus first mentioned the steam bathing phenomenon in Russian lands when describing the Scythians (c440 BC) having baths in their tents by pouring water on hot stones to get a steam effect inside (the same way that native Americans did, as was found out centuries later). While it is impossible to establish which country actually invented the steam bath, the banya was known in these territories long before they were called Russia (the first mention of Russia – Kievan Rus – occurs in 9th century). Since then the banya has become an essential element of Russian culture. This description may seem somewhat strong in terms of “banya violence”, especially when one sees the modern, mollycoddled generation relaxing and enjoying themselves in the steam room, careful to keep their lashing to a minimum. Nonetheless, the rest is an accurate portrayal of the rituals that have been followed in Russia since ancient times. 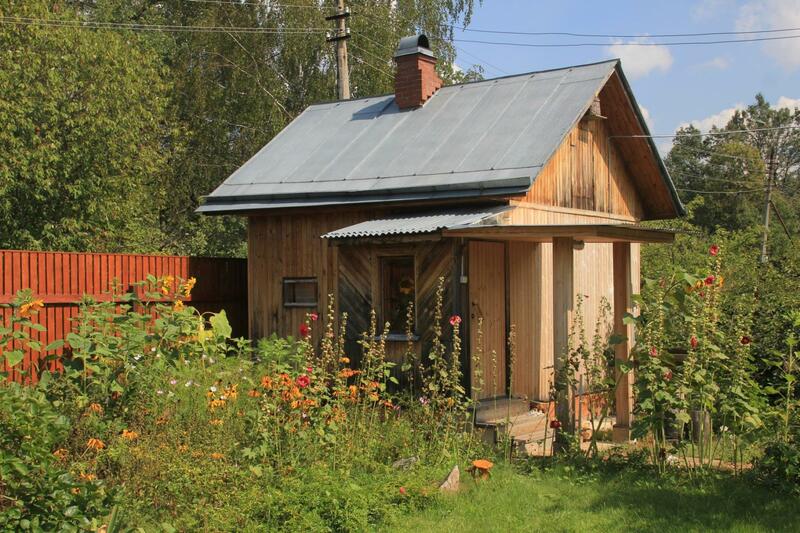 In many ways the Russian banya has much in common with the Finnish sauna. This could be explained by the fact that in the first millennium A.D. both Finland and North West Russia were populated by Finno-Ugric speaking peoples. At that time, people both in the Kievan Rus (modern Ukraine and South Russia) and the neighboring Turkic-speaking merchant state, the Bulgar Khanate, already actively used the banya in their day-to-day life. Banya culture also has its origins among the Turkic-speaking people who came to Kievan Rus and the Bulgar Khanate with Genghis Khan’s hordes. 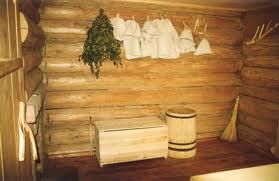 In fact the Russian banya of today is an amalgam of the centuries-old skills and traditions of the peoples who once populated the lands of the former Russian empire. There is even a tale of the Kievan Princess Olga, who in the mid-10th century avenged her husband, Prince Igor and killed her enemies from a rebel tribe after inviting them to her banya (the first mention of the socio-political function of the banya). There have always been both public and private banyas in Russia. At the time of Peter the Great (early 18th century) in big Russian cities there were rules governing their use. In summer, people were only allowed to use their banyas on certain days (Thursdays or Saturdays), in order to avoid the fires that had become a scourge, since at that time the majority of buildings were made of wood. However, the local authorities also had the power to grant the privileged few the right to have a banya on other days of the week. In those years, banyas were wooden shacks built on the banks of lakes and rivers. 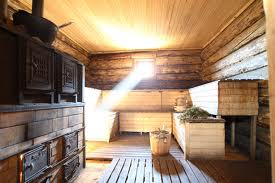 There were the so-called “black” (without a chimney, either more ancient or less expensive) and “white” (with a chimney) versions of the banya. In the “black” version, the smoke coming from the fire on which the stones were heated was let out through the entrance or via a special hole. 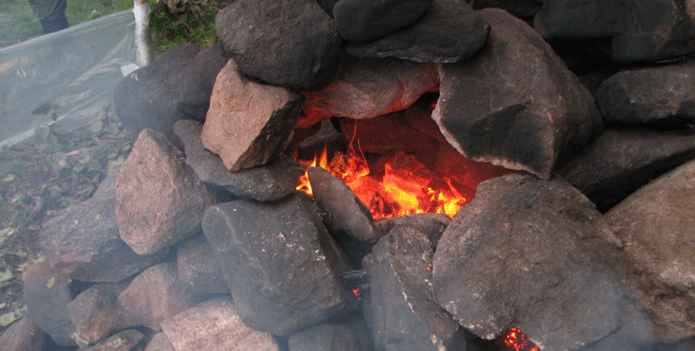 When the stones were hot enough, the smoke was removed and the hole was shut. After that, water was poured onto the hot stones, producing steam which helped to remove dirt from the surface of the skin and clean the pores. The subsequent bathing in cold water had both an invigorating and cleaning effect on the heated body and resulted in a desire to repeat the procedure. 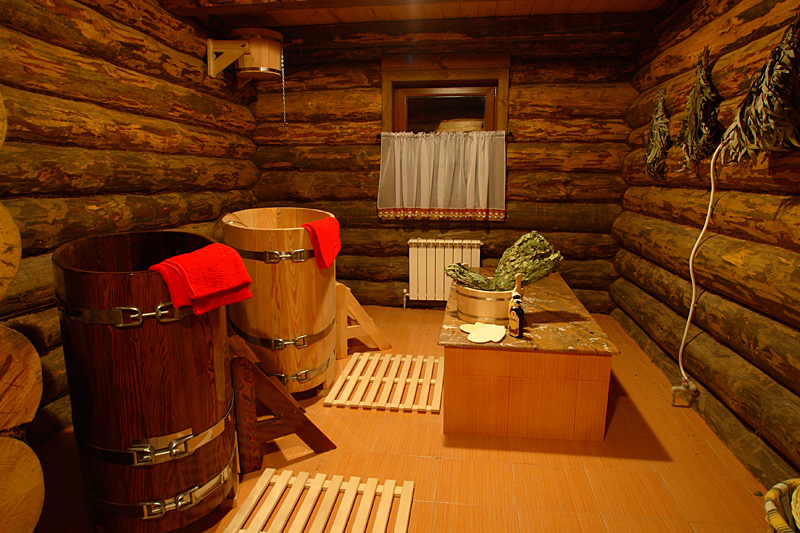 The “white” version, without smoke in the steam room (parnaya or parilka), would be considered a more luxurious and technically advanced banya. Generally, in full versions of the banya, there were three compartments including the rest room, the washing room and the steam room. Very often, the steam rooms were combined with the washing rooms, with lakes and rivers replacing water buckets and modern showers. When you go to a banya, you should have a hat to wear in the steam-room as keeping your head covered is strongly recommended. Traditionally these hats have always been made of thick felt. Nowadays there are many souvenir banya hats on sale, with quasi-military and historical styles available (Napoleon, Cossack, pilot, army helmets, etc). The main point is that they should not be tight and should protect your head (including the tips of your ears) from the heat. Of course, you should also have a vennik with you – ie. a bunch of birch or oak twigs to be used for lashing your body in the steam room. Lashing can be carried out by your own hand or somebody else’s – on request. The best option would be to bring your own home-made vennik which is next to impossible. For that, you have to go to the country in June, cut the twigs, tie them, dry them and then store them somewhere. Banya-goers often take specials pads made of wood or felt with them to sit on, as well as cotton sheets or long towels for lying in the steam room. Sheets are also used to wrap oneself in the rest room. Traditionally, men and women go to the banya separately. Men are the first (to take the hotter steam) and women go after them, if they use the same banya. There are separate sections for men and women in modern public banyas. During a session, banya-visitors usually go to the steam-room parilka several times for 5-10 minutes at a time, according to how they feel. The first one or two goes are used to warm up the body and prepare for steaming and then the lashing with the venniks. When the time comes to use the venniks, the steam is created in the room by throwing small portions of water on the heated stones until it becomes bearably hot. Then, those present in the steam room wait until the steam lands, or they “help” it to land, by rotating a sheet or towel near the ceiling (in modern banya slang this procedure is called “helicoptering”). After the steam subsides, lashing withvenniks starts. This will usually continue either until the heat goes, or the victim calls a halt. Banya users either beat themselves on the legs, arms, chest, upper and lower back or they can ask somebody else to do it for them. A cold shower or a dive in a cold water pool follows. Depending on the strength of the oven, this process can go on for several hours, with diving into a cold pool in between sessions. The vennik sessions can be repeated several times, though the main thing is that they should bring pleasure and not involve undue suffering. To enhance the relaxing and healthy effects, various substances, including mint, chamomile, leaves of eucalyptus, absinthe, wormwood, beer and even mustard are often added to the water thrown on the walls or on the hot stones (depending on the concentration). Essential oils of various plants can also be used. It is most important to maintain the right fluid balance in the body after the intensive sweating has driven out all the toxins. To that end, people drink herbal tea or a briar drink in between parilka sessions. The healthy effect of banyas has been enshrined in Russian sayings such as Banya parit, banya pravit (banya steam makes the body right), Zharky par lyuboy nedug istselit (hot steam cures any illness) etc. Since the time of Ancient Rome and Roman thermae, steam bathing, technically speaking, has involved high-temperature steam treatment that removes waste products from the body through sweating – resulting in a pleasant sense of relaxation and repose. The idea behind the Russian banya is essentially the same but the process differs in several ways. The first difference is in the temperature and the humidity, and here the Russian banya falls between its Turkish and Finnish counterparts. The temperature in the Russian banya is about 80-90 degrees which is balanced by moisture. The more humid the air and the higher the temperature, the less comfortable the steam is. The second point regards the inside/outside temperature differential. Only in Russia you can heat yourself up till you can hardly bear it and then go outside and douse yourself with snow when the temperature is 10-15 degrees below zero. Such a contrast is natural for Russia where you have low temperatures for the most of the year (although, in Finnish saunas the temperature differential is about the same and diving into cold water is also practiced). Alternating between hot air and ice-cold water is very stimulating (for people in good health) as it makes the blood vessels expand and contract, thus keeping them elastic and toning the whole body. One important point is not to expose the head to the impact of hot air and cold water. For this purpose all banya-goers should wear the special felt hats mentioned earlier. The third important difference regards the venniks (bunches of birch, oak or fir tree twigs). Birch, oak trees and fir trees have a special impact when they come in contact with the skin. They stimulate the flow of blood to the outer layers of skin, thus massaging it and helping to draw waste out through the pores. The birch tree is a symbol of Russia and her beauty. In Russian villages they still have a tradition of decorating birch trees during the feast day of St. Trinity in June. This feast day is the ideal time to cut birch twigs and make your own venniks (banya brooms). Excessively high temperatures and forceful beating are not required as the goal (as confirmed by modern medical science) is to stimulate blood circulation in the upper layers of the skin. People generally go to a banya on an empty stomach, as the process does not help digestion of anything consumed beforehand. Steam bathing is not compatible with drinking alcohol either. However some food and drink can be consumed afterwards, which is all part and parcel of the banya tradition. The place of the banya in Russian culture is vividly illustrated by the numerous banya episodes and references in Russian literature and folklore. Many famous Russian and Soviet writers and poets, including Pushkin, Tolstoy, Chekhov, Dostoevsky, Mayakovsky, Zoschenko, Shukshin and Vysotsky (among others) used the “banya theme” in their works – an acknowledgement of the role which the banya has played and still plays in people’s lives. Remarkably, the authors generally write about social and political issues in the pieces connected with the banya. The banya theme is also often used in humorous stories and essays and always involves ordinary, everyday people. Dozens of banya-related sayings and proverbs have found their way into the vernacular – some are used even when there is no actual banya involved. “Increase the heat/steam for somebody” poddat zharu. Make the situation more difficult for somebody. “Sticky as a banya leaf.” prilip kak banny list. Russians say this about importunate, annoying people, including children, journalists and anybody else who is persistent in distracting the speaker from what he is doing. “Bones don’t ache from steam” par kostey ne lomit. Also used in various situations. This means that hot temperatures don’t hurt, i.e. hot is preferable to cold, eg. when wearing warmer than usual clothes, or keeping higher than moderate temperatures in the house. “Go to the banya” pshel v banyu. A popular short curse, equivalent of “go to hell,” though technically it looks a bit kinder. “Everybody says what he wants and a lousy person talks about banya” kto pro shto, a vshivy pro banyu – said when a boring subject is touched upon. Interestingly, the general meaning of these sayings could be associated with a kind of self-purification, distancing the speaker from the things/people he or she doesn’t want to get involved with. According to Russian tradition, people going to the banya, be it private or public, enter the steam room naked. Maybe, the Russian urge for justice and equality gave birth to the saying: “In the banya everyone is equal” v banye vse ravny. As in any country with a steam bathing tradition, the Russian banya is also a place to meet with friends and discuss business. Although genuine banya aficionados (whose numbers seem to be diminishing every year) would never mix the banya with drinking alcohol, there are some who do. From time to time a scandal hits the headlines (usually on the eve of elections) revealing that the wealthy and powerful of this world – including politicians – carelessly use banyas as a place for boozing and orgies, just as they once did in Ancient Rome. This would seem to confirm the Third Rome theories – according to which Moscow is the Third Rome. (The second one was Constantinople, the capital of the Orthodox Christian Byzantine Empire. A niece of the last Byzantine Emperor married a Moscow Prince in the mid-15th century, and brought part of the Emperor’s library to Moscow, thus symbolizing the adoption of Roman spiritual traditions and geopolitical power by Russia. If so, the decay and debauchery of both ancient capitals was inherited to some extent along with all the rest). Banyas in Russia are equally popular among men and women of all ages. However, men appear more prone to turn banya sessions into parties, drink alcohol and smoke in the rest rooms – which is equivalent to doing the same things after going to a gym or after a workout. 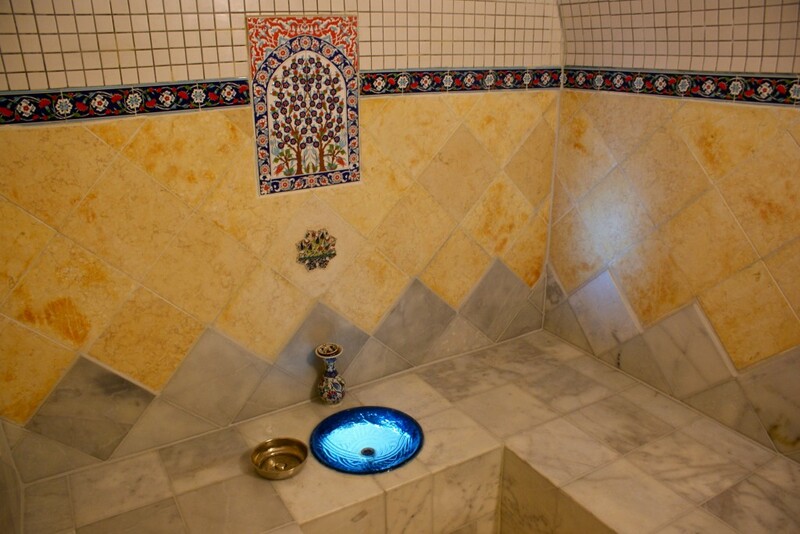 Many banyas are furnished with small water pools, some of them filled with cold water so that banya-goers can refresh themselves after leaving a steam-room. Some have bigger swimming pools which attract children, many of whom have their first taste of the banya through the use of these pools. The downstairs banya is about 600 rubles for 2 hours, which is plenty of time to have 3 rounds in the banya and time to rest and chat in between. The advantage of the lower banya is the pool, while the upstairs is a VIP banya. A must when in Moscow, enjoy the bath have a drink and food. Massage and spa services are also offered. 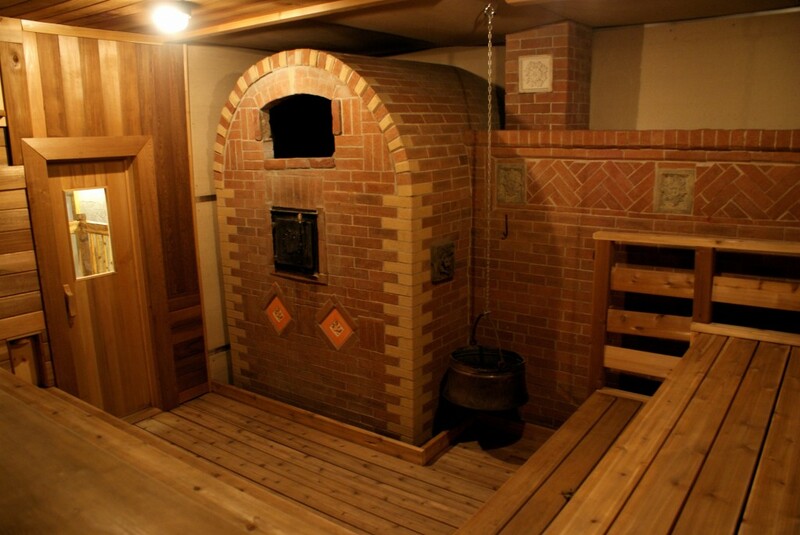 An authentic Russian Banya in London with unique original stove carefully designed and built by Russian professionals. The quality of the Banya experience relies heavily on the stove. Indulge yourself with famous invigorating Venik massage, scrub, body wash and massage will be a great complement to your day at Banya No.1 Relax on your own or enjoy the company of friends in the lounge bar with refreshing drinks and Russian delicacies to complete your experience. Banya 5 is a modern adaptation of an authentic Russian bathhouse. It provides a buffet of amenities including the traditional series of cold-plunge baths, saltwater tepid baths, and hot whirlpools. In addition to relaxing soaks, this co-ed spa includes authentic Russian sauna ovens, Turkish steam rooms infused with the aroma of eucalyptus and signature massages, salt and mineral scrubs, and mineral mud wraps for skin exfoliation. An authentic full-treatment Russian Banya service, including a traditionally-built sauna designed to improve blood circulation. Also offered is venik massage, an essential component to Russian Banyas in which leaves are used to reduce pathogens in the body. 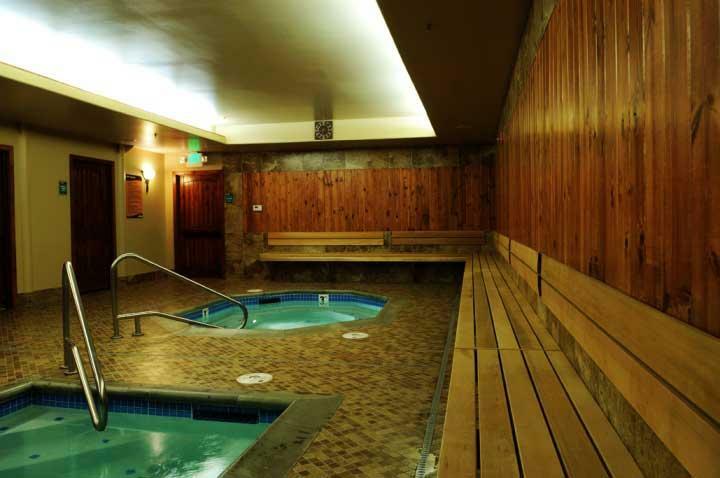 A chlorine-free, ultra cold plunge and warm Jacuzzi. Saunas, recognized by many cultures for their healing qualities, are also available, as well as your pick of different traditional massages and natural exfoliation scrubs. For post-relaxation conversation, retreat to the lounge and bistro. The Izba Spa incorporates the traditional Russian banya with therapeutic massage and modern methods of holistic therapies to encourage health, facilitate rehabilitation and reduce stress. Therapies at Izba focus on overcoming sudden or chronic energy blocks and to restore the normal flow of internal energy to the affected part, or to the entire body.